Watching any of the 24/7 news channels can be real nauseating as hosts and commentators, depending on their political bent, will say and spin anything, even switching gears in midstream just to benefit their party of choice. I recently detailed my close observations on radio/TV host Sean Hannity and chronologically demonstrated that he truly lacks a solid belief system, or a core. Of course, Hannity is not alone, he is just a real obvious example. Then there are those linked to a party who are general unknowns, but express their thoughts on social media and an observer can gauge from a relatively short time how positions and rhetoric changes, again demonstrating a lack of a core. One example is former South Florida Republican US House candidate and current co-host at The Truth Is Out There-Voice of the People Radio Show, Joe Goldner. Goldner is a fixture on social media and just a few short months ago, he continually blasted current Republican Presidential nominee, Donald Trump. Equivalent to Glenn Beck, Goldner was so deep in bed with Ted Cruz, to the point where it was sickening. He defended Cruz on every point and battled against Trumpsters with a great deal of enthusiasm. I AM SICK AND TIRED OF LISTENING TO TRUMP SUPPORTERS TRYING TO TELL ME THAT AT LEAST TRUMP IS NOT AS BAD AS HILLARY! HOW SO AND MORE IMPORTANTLY___ SO WHAT? Is he honest?- NO! Is he ethical?- NO! Is he moral?-NO! Does he have principles?-NO! Does he have scruples?-NO! Is he fit to be America’s President?-NO! Is he a Conservative or even really a Republican?-NO! Does he have integrity?- NO! does he oppose abortion?-NO! Is he willing to abide by the Constitution? NO! Does he oppose amnesty for illegal Aliens?-No! Is he mentally stable?-NO! Is he supported by the majority of his own Party?-NO? Is he someone who obeys the law of the land?-NO! If he trustworthy?- NO! Do the American People respect him?-NO! Do the majority of the American people even like him-NO! Is he a President that we and our children can look up to and admire? NO! Does he support the 2nd Amendment unconditionally?-NO! Does he support the 1st Amendment- NO! Do we know for certain that he will only appoint Conservatives to the SCOTUS?-NO! Does he have self control?-NO! Does he have any experience?-NO! Has he ran a clean honest campaign-NO! Does he even have a clue?-NO! IS HE AN CORRUPT UNSTABLE PSYCHOPATHIC LIAR?- YES! Am I going to vote for him?-HELL NO! Pretty harsh–unethical, dishonest, no integrity, an unstable pathological liar…clearly the “conservative” mouthpiece did not think Mr Trump was worthy of much of anything, clearly not his vote. Just a few days later, Goldner again made it very clear what he thought of Trump writing, NO ROCKET SCIENCE needed to realize Trump is a fraud! 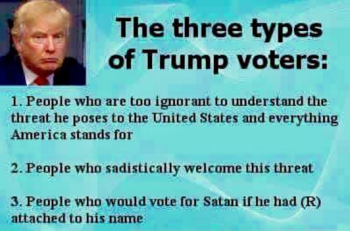 See the meme he posted on Facebook a few months ago to the left to see how Goldner felt about Trump supporters. Wow, a lot has changed! Yesterday, he writes about Trump supporters–Trump Supporters are AMAZING!! Goldner writes Trump sounds like John Kerry. he is a disgrace for that comment. We can stop this idiot at the convention. All the delegates , I mean all of them must follow the rules and vote who ever is the right person to be Commander in Chief even on the first ballot. Trump with this statement disqualifies him from that post. On June 7, he effectively compared Trump to Hillary Clinton and Bernie Sanders–350 MILLION Americans and THIS (as things stand now) is the best we could do? A possible election between two whining liberals? Thank GOD I have enough sense to vote for a true Constitutional Conservative!#NEVERTRUMP, #NEVERHILLARY, #NEVERBERNIE. And by the way…don’t be blaming me…I didn’t get EITHER of these liberals to the nomination. Goldner has attacked Trump on the Constitution and the Bible– Trumpsters sold their Constitutional Rights to a man named Donald Trump who has not studied the Constitution or Bill of Rights! Let alone read the Word of God! On Trump’s treatment of women and an interview published with Barbara Bush several months ago, Goldner wrote: None of this would be happening if Trump did not trashed Bush and the family on public TV . Trump also has a long history of trashing women , just ask the women that worked for him in the past. Just yesterday, he wrote on a social media account: Concerning abuse and treatment of women–everything that is happening to Trump right now is a hoax , a fairy tale, a con job to discredit him because he will defeat Hillary and they know it so this is the lie. Good grief!! Politics is such phony-baloney nonsense and the shame is people put so much faith in these candidates and political parties as if it will make any discernible difference. Goldner, now on the Trump train (not clear what changed, has all those points he made above changed about Mr Trump?). I get it that Hillary Clinton is bad, very bad, but Goldner talked about Trump very clearly just a few months ago of how terrible he is, and he sounded very definitive. Not clear what changed. Is Trump a real conservative now? Do we now know for certain he’ll appoint conservatives to the Supreme Court now? Does Trump now support the 1st and 2nd amendments? Apparently, Goldner thinks Trump had some magical Constitutional epiphany and is a totally different candidate from June. Or maybe Goldner, like Hannity, has no core. Last words from Joe Goldner as of Saturday–Trump is what the people want. It is a movement and this record proves it. Get on board the Trump Train now! Vote for Donald J trump for President on November 8th. Ted Cruz: Does he believe in bailouts or not? What do I want from the President?